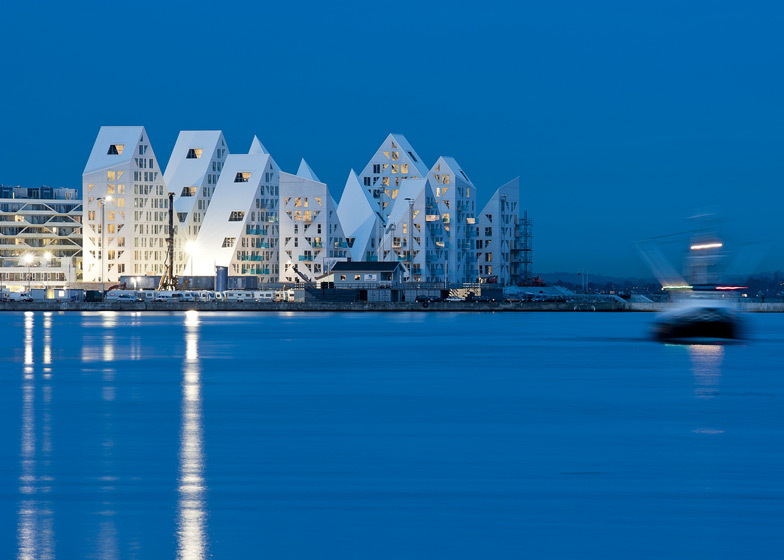 A team of architects including JDS Architects and CEBRA are close to completing this harbour-side housing development modelled on a cluster of floating icebergs in Denmark (+ slideshow). 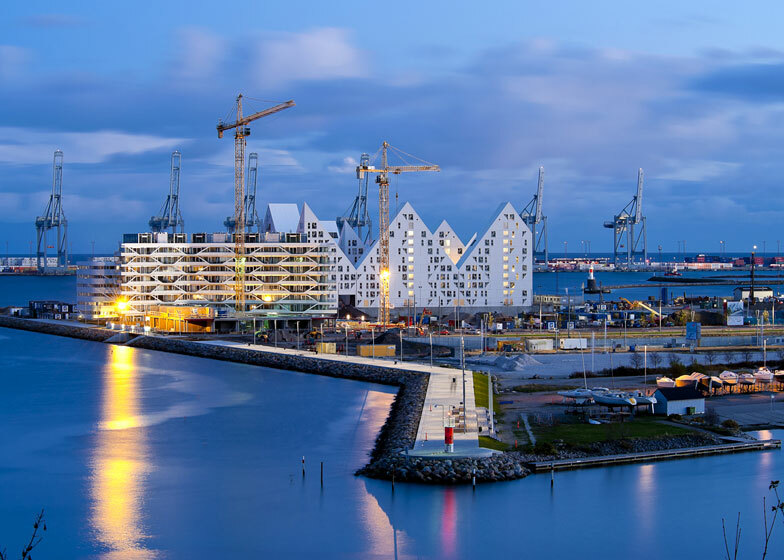 Due to be inaugurated this spring, the complex is one of the first projects underway at De Bynære Havnearealer, the new docklands quarter of Aarhus that is set to accommodate 7000 inhabitants and around 12,000 new workplaces once complete. 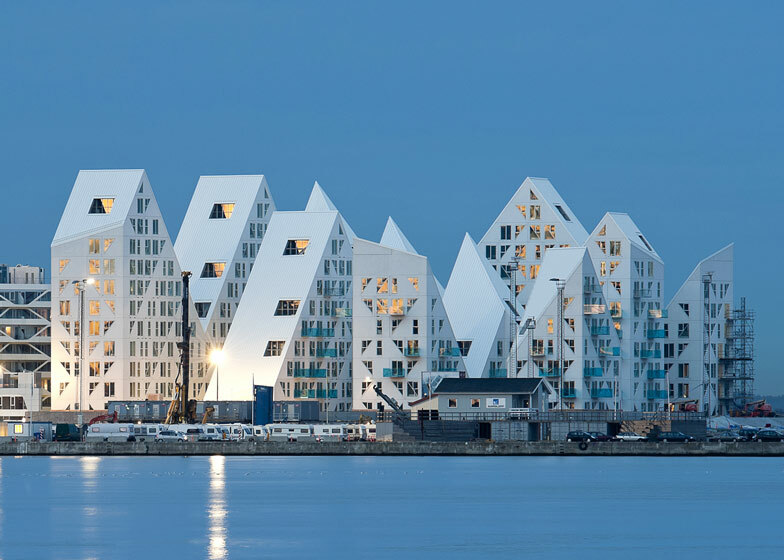 JDS and CEBRA teamed up with Dutch studio SeARCH and French architect Louis Paillard to design the buildings, which have been collectively titled Isbjerget, or "The Iceberg", in reference to their jagged white forms. These volumes are described by the architects as a series of "peaks and valleys" that are deliberately tapered to create visual corridors between buildings. Over 200 apartments are located within the four L-shaped wings of the complex, including two-storey townhouses in the lower levels and penthouses located on the uppermost floors. The architects won a competition to design the Isbjerget complex in 2008. 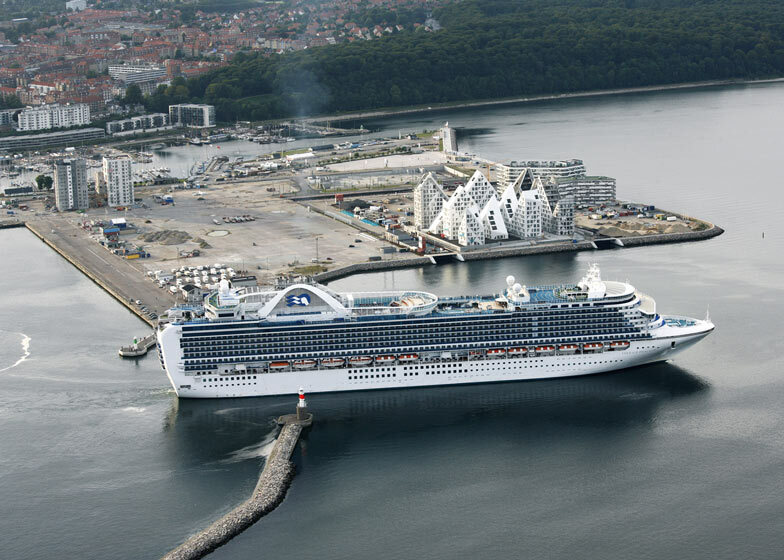 A number of large developments are in progress in Denmark's docklands, as ADEPT and Luplau & Poulsen are working on another harbour-side housing project in Aarhus, while Tredje Natur and PK3 have redesigned Copenhagen's harbour with a series of artificial islands. See more architecture in Denmark. Photography is by Mikkel Frost, apart from where otherwise indicated. 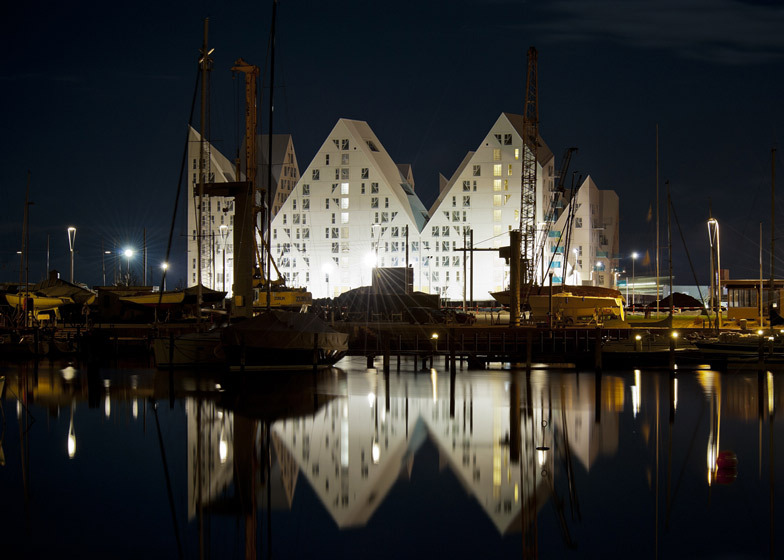 Isbjerget (the Iceberg) is located at at a prime location on the outmost harbour front in Aarhus' new quarter 'De Bynære Havnearealer'. Like many other industrial harbour fronts, the former container port of Aarhus is being transformed into a dynamic new neighbourhood. Isbjerget is among the first projects to be finished in an area that on completion will be home to 7,000 inhabitants and provide 12,000 workplaces. Its total site area of 800,000 m2 makes it one of Europe's largest harbour front city developments. The inspiration for Isbjerget originated primarily from the site's extraordinary location. Isbjerget is laid out as four L-shaped wings, where the street spaces in between open towards the water. 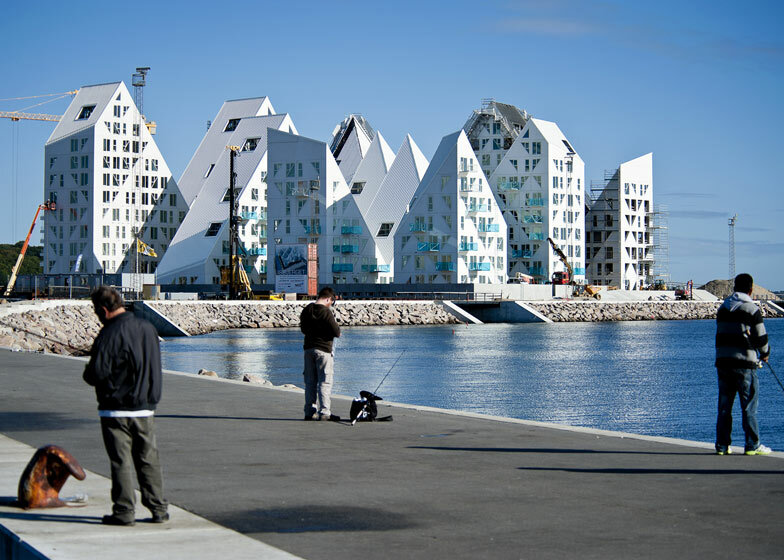 In order to obtain optimal daylight conditions and views over the bay, the building volumes are cut up by jagged lines. The roofs rise and fall into peaks and valleys, which create visual passages that across the individual volumes - like floating icebergs that constantly refract one's gaze. Thus, even the back wing's residents can enjoy the view. The varying and spectacular forms that derive from this simple algorithm make it possible to fit a varied range of different dwelling types within the complex – from two-storey 'town houses' and affordable smaller flats to exclusive penthouses in the peaks of the iceberg. The variety of residences with different balconies, shapes and orientations as well as the combination of owner-occupied and rented flats aim at creating socially diverse urban surroundings that form a lively local community: the building complex becomes a neighbourhood instead of a mere series of housing blocks.